SEATTLE (AP) — Chris Petersen has said repeatedly that if Jake Browning is given the chance to scan the field and set his feet, it’s awfully difficult to slow down Washington’s senior quarterback. The past two weeks have shown just how important the protection is for the efficiency of No. 10 Washington’s offense and how much the Huskies offensive line has improved since the season opener against Auburn. 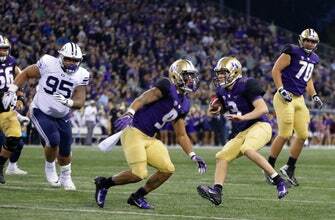 Browning was under immense pressure in Washington’s first two games facing FBS opponents Auburn and Utah. He was sacked five times against Auburn and pestered consistently by Utah although he was sacked only once. But in the past two games, Browning’s protection has improved dramatically and so has the efficiency of Washington’s offense. Browning was sacked just once against Arizona State — for a loss of 2 yards — and he was rarely touched against BYU. Browning was sacked only once by the Cougars on the first drive of the game when he was called for intentional grounding. Otherwise, Browning was kept clean and because of that the Huskies quarterback turned in one of the most efficient passing games in Pac-12 history, completing 23 of 25 passes. Washington’s offensive line was deemed a strength before the season, but the Huskies lost left tackle Trey Adams to a back injury in the week leading up to the opener. The Huskies struggled at times during the first three weeks as the line figured out how to make up for not having the expected starting left tackle. While Adams and tackle Kaleb McGary are projected to be NFL starters, the anchor of the group is Harris. He received plenty of praise after the win over Arizona State for making sure the protections were set against a defense known for its unique pressures and fronts. Harris got just as much recognition for his slide-step and point after an Arizona State defensive lineman crashed into him on an offside penalty. Of course, that meant for most of last week before the BYU game, anytime Harris walked through the Huskies locker room teammates were trying to impersonate the point back at him. While Harris’ moves got him recognition against Arizona State, it was his hustle that stood out against BYU. With the Huskies leading 28-0 midway through the third quarter, Salvon Ahmed got loose on a 28-yard run. Ahmed was hit from behind and fumbled, and in the ensuing scramble Harris ended up falling on the loose ball 37 yards from the line of scrimmage. The Huskies’ protection may not get much of a test this week against UCLA, which has just seven sacks in four games. But looming is a showdown in two weeks against Oregon and its much-improved defense.